Here is the link to the article published in The Ledger https://goo.gl/UKvD18 or read it below. LAKELAND — Joe P. Ruthven had been telling his children he’d retire when he turned 90, but now he’s thinking 100 would be a better age. At 90 years and 1 month old, he walks two to three miles several times a week with his wife, Judy, and follows her lead in eating a healthy vegetarian diet. He takes only one prescription medication; his energy is strong. A few hours behind the wheel of his car is no problem so he can easily visit any of the 85 properties built by the warehouse development firm he founded and owns, The Ruthvens. All the properties are within 25 miles of the downtown office at 41 Lake Morton Drive. Ruthven knows what it is like to be a struggling small businessman, to dream, take risks and put in long, hard, worrisome hours. He likes to give a boost to small tenants and is delighted when they succeed. 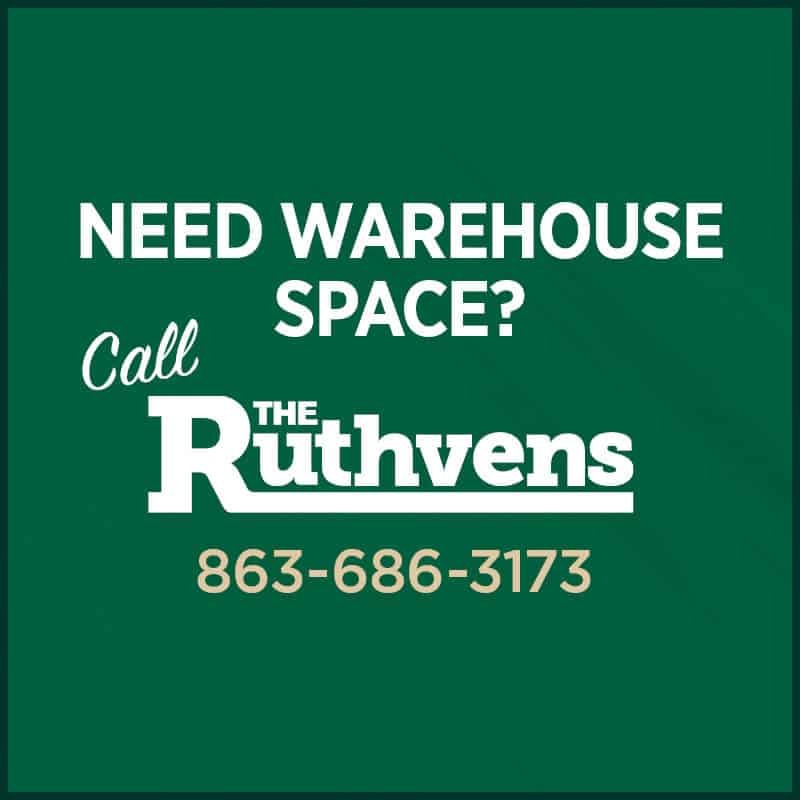 Although The Ruthvens owns 3.5 million square feet of warehouse space, the company is still growing. Showing his company’s warehousing complexes near Lakeland Linder Regional Airport, Ruthven points out acreages he’s purchased, some ready to go into development, others still lying fallow. “Have you ever seen so many trucks?” he asks, as he pulls alongside a 100,000-square-foot building leased to Forward Air, a logistics company that distributes goods to retailers, employing 100 workers and 50 drivers. 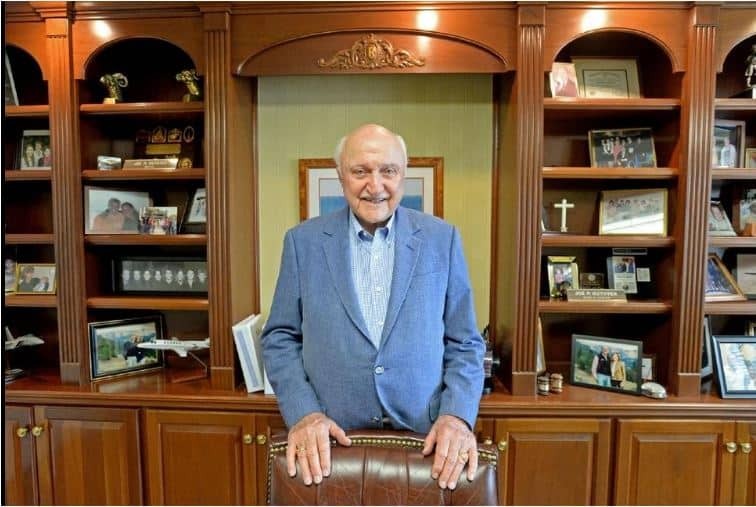 He rattles off the variety of products distributed or manufactured under The Ruthvens-leased space: cotton balls, tomatoes, Purina foods, spice packets, caskets, rum, water, pharmaceuticals, clothes, vitamins and a wide variety of suppliers to Publix. “Joe was ahead of the curve in warehousing, before it was in vogue, long before Amazon and O’Reilly’s came to Lakeland,” said Gene Strickland, a former Lakeland city manager who became friends with Ruthven in the late 1960s and early 1970s when Ruthven was on the City Commission. Ralph Allen, a financial adviser and chairman of the family-owned firm Allen & Co, “I am sure if it was not for The Ruthven efforts, many businesses would not have started business interests in Lakeland. Ruthven said arrival of Amazon’s million-square-foot warehouse/fulfillment center has been a huge boon to the Lakeland economy. “When companies in New York or California or anywhere in the country or abroad hear that Amazon came here, they know Lakeland has been checked out thoroughly and they want to come too,” Ruthven said. Keeping The Ruthvens’ buildings in the 100,000 square-foot and under range allows the company the latitude to recover if a leasee moves out, or worse, if a tenant’s business fails, Ruthven said. Joe Perry Ruthven was born on July 9, 1927, to Agnes and Joe Ruthven, the third of five children, on a small farm in Chesterfield County, S.C. There was no electricity, no running water; chores began at 5 a.m. and picked back up after school. He grew up during the height of the Great Depression in one of the poorest counties in South Carolina. He recalls one sharecropper family from a nearby farm so destitute their children went naked until his mother made them clothes out of flour sacks, and later, regular clothes. And he recalls the changes that came after President Franklin’s Roosevelt’s Work Progress Administration and other relief programs came to the area. His family did relatively well and each year his dad tried to add 10 acres to the farm where they grew tobacco, cotton and other crops, he said. But he realized early-on that he did not want to be a farmer, staring at the rear end of a mule, he said. Still, the work ethic of a sunrise to sunset day stuck. “I guess I carried that over into the rest of my life,” Ruthven said. He had graduated from high school just before his 16th birthday and spent a couple of semesters at the University of South Carolina before enlisting in the Navy at 18. He was in boot camp when the Japanese surrendered, ending World War II. While thousands upon thousands of troops were returning from overseas, he was assigned tug boat duty at Norfolk, Va., helping pull into harbor the huge ships bringing the battle-weary men back to American soil. They would discharge 4,000 to 5,000 men as they came off the ship, pay in hand and nowhere to go, except maybe downtown Norfolk, before heading home, Ruthven said. “We and everyone from the area knew not to go downtown after a ship had come in; it was wild,” he said. Ruthven said, that he as walked back on campus his first day, he saw a couple of girls shooting pool and stopped to introduce himself. One of them was Jeanette “JJ” Chiles of Lakeland, who would later become his wife. The couple had two sons and a daughter. JJ died in 1982. In 1984, he remarried, to Judy Story. The GI bill paid his tuition and, for spending money, he took a part-time job with JC Penney. Upon graduation with a business degree in 1948, Penney’s offered him a full-time job at $200 a month which sounded OK but then BF Goodrich gave him a better offer, $250 a month, he said. So he went into the tire business. He moved his growing family three times as he went up the management ladder over the next decade. In 1957, he and friend Eugene “Blackie” Black decided to start a tire store in Lakeland. Ruthven’s father-in-law Lawton Chiles Sr., gave Jeanette a lot at 600 Memorial Blvd. for the store. After hiring an architect to design the building and a carpenter to pull permits and supervise, the two partners supplied the labor. Five months later, they opened an OK Tires. They had spent most of their combined $10,000 on the move and construction so struggled to stock the store, but managed to do it after securing a $1,000 loan, plus securing a supply of retreads and used tires. That first year, he and Black did all the work: sales, changing tires, bookkeeping and keeping the place shined. At the end of the year, they had made $7,500. After that, they not only survived, they grew and started hiring employees, including Ruthven’s two brothers, Jerry and William Ruthven. Eventually, the partners opened a second OK Tires store. In the late 1960s, the home company, OK Tires and Rubber, wanted a warehouse in Central Florida and asked Ruthven if he could find a 10,000-square-foot space near a railway. “I was interested in branching out into real estate,” he said. After looking at available spaces, he decided to build the warehouse and lease it back to the company. A friend, Kirk McKay, agreed to sell him 10 acres on Mine & Mill Road with only $100 down and a personal note, starting Ruthven on a new career. The acreage was large enough that he was able to double the square footage and quickly found a second tenant for the other 10,000 square feet. Financing the construction was another issue, especially because he was building on speculation, something others were not doing. He would go from bank to bank trying to get loans, he said. “I would get turned down about three times more often than I was approved,” Ruthven said. But after the loan officers realized he was able to lease the space and he was making the mortgage payments, it became easier to get financing. “I don’t think we have ever missed a mortgage payment,” Ruthven said, although there were times when he was worried whether he could put groceries on the table. In 1974, after 17 years in the tire business, he and Black sold OK Tires, Black’s wife wanting to return to South Carolina and Ruthven wanting to go full time into real estate. When Jeanette Chiles and Joe P. Ruthven married on Sept. 4, 1949, his parents stayed at the Lakeshore Hotel at 41 Lake Morton Plaza. Some 25 years later, Ruthven bought the old 32-room hotel. “I thought it would be fun to run a hotel,” but it only took a day to change his mind, he said. That first morning, a retired professor, a 97-year-old man, who rented a room came downstairs and said he was going to take a bath. Ruthven said, OK, but then the old man said someone had to sit with him. From there as he watched the comings and goings, he realized a staff member kept coming from the back room to get clean sheets. “It was only two blocks from City Hall and no one over there knew what was going on,” Ruthven said, still amazed more than four decades later. Ruthven was looking for an office so decided to convert the stately hotel. It took two years to reconfigure the 1920-era building. Since then, it has been renovated twice to fit the needs of The Ruthvens. “It is challenging” to keep up a 100-year-old building, he said, recounting a recent country-wide search for tiles when the roof leaked. When Ruthven and Jeanette Chiles married, her younger brother, Lawton, was still a student. But Lawton Chiles later became one of Lakeland’s most famous native sons, a Democratic politician who served in the Florida House and Florida Senate through most of 1958 through 1970, the U.S. Senate from 1971 through 1989, and as governor of Florida from 1990 until his death on Dec. 12, 1998. Even before he met his brother-in-law, Joe P. Ruthven was a confirmed Democrat. Ruthven said he and other family members often had helped Chiles with campaign duties so it was not much of a leap when he he decided to run for Lakeland City Commission. He served on the commission from 1969 through 1971, the last year as mayor. Schools were being integrated and racial tensions were high, Ruthven said. Ruthven said Dr. John S. Jackson, an African-American physician, worked closely with him; the two attended community meetings together, bolstering one another. And at the schools, Willy Speed, a coach at Kathleen High School worked alongside him. There was a lot of unrest and “I am glad that time is behind us,” Ruthven said.